Kitchens are the heart of the home. They are where we spend a good deal of our time and one of the main rooms that experiences the most amount of wear and tear. When considering home improvements or a renovation, the kitchen is the first room that draws our focus. The kitchen is arguably the main room that dictates the overall design and style for the rest of the house. It is no longer simply a food preparation area but rather a hub where the family gather and hang out. This means our kitchen designs evolve much faster than any other room in our home and are the rooms to be renovated the most. With this kitchen at the heart of the living area, it’s a great space for the family to gather and talk. When it comes time to renovate your kitchen, it’s a good idea to take in the current layout and consider changes to the layout that are better suited to you and your family needs. What design elements would you like to incorporate or layout changes you would like to make that would really make the most of your kitchen space? A breakfast bar, a butler’s pantry, or maybe even a small office nook. The opportunities are endless. If you’ve been using your existing kitchen for many years, deciding on the layout be a fairly easy process. No doubt you have thought about the functionality while using your kitchen and can easily identify what parts of the kitchen layout works for you and what parts don’t. Above everything a kitchen needs to be fit for purpose and meet standard functionality requirements. This means your refrigerator, stovetop and sink ideally need to be positioned in a triangle formation not far from each other. This is known as the ‘working triangle‘. If your refrigerator, stove and sink are too far apart from each other the kitchen becomes less functional and cumbersome to use. Having designed numerous kitchen renovations, Exactus Homes can help guide you in your new kitchen design and layout options if you are not quite sure what layout will work best for your home. Your kitchen renovation will ultimately be driven by your renovation budget. Kitchens can become a costly room to renovate, however this doesn’t mean that if you are on a tight budget you will not be able to achieve a beautiful and functional kitchen. It simply means being smarter with where you spend your renovation dollars and spending more money in the areas that count while saving in the areas that do not impact on the overall result. Understanding kitchen renovation costs can be confusing if you haven’t renovated a kitchen before. 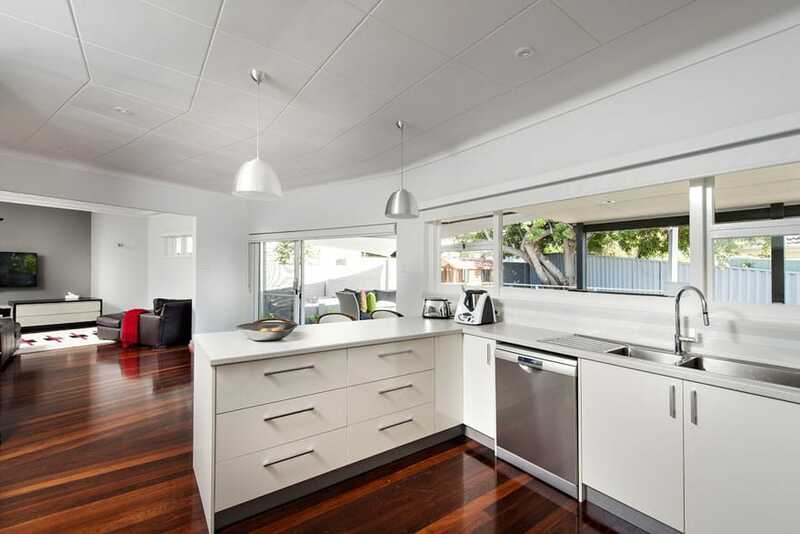 There are elements of the renovation that can be overlooked as a first time renovator when it comes to compiling a kitchen renovation budget. Going through your budget with your home renovation specialist is the best way to ensure you have covered all your bases and no costs are overlooked. When it comes to materials in your kitchen renovation, there is a wide range of products and finishes available. Stone, glass, tile, timber. The options are extensive and can actually be quite overwhelming when you start doing your research. The easiest way to narrow down on the materials and products that would be best suited to your kitchen renovation is to consider your budget along with the overall design style of your home. Deciding whether you want a sleek streamlined modern kitchen or a classic traditional style will help narrow your design choices and the materials you to use. Gathering a collection images showing your design ideas will help. Once you have narrowed down on the design of your kitchen, you can start to research the fixtures and finishes that fit this design and are within your kitchen renovation budget. 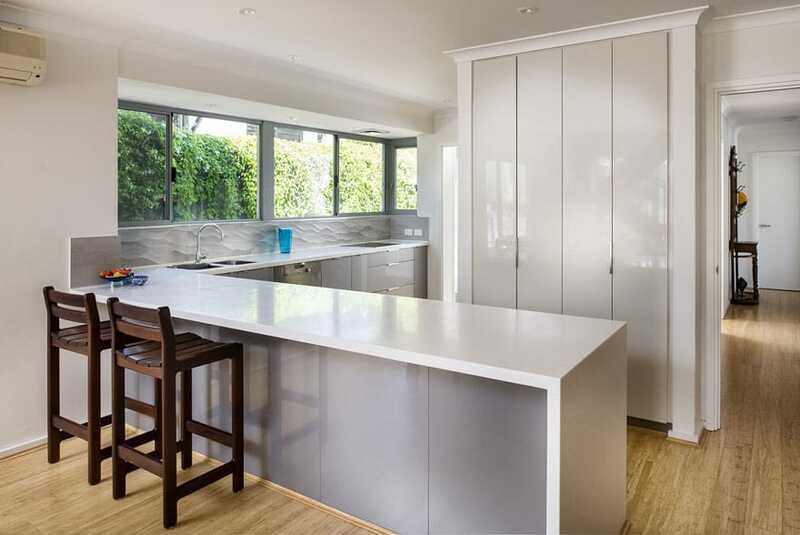 The choice of materials in a grey colour palette, and the selection of different textures produced a great final outcome for this modern kitchen renovation in City Beach. When designing your new kitchen it’s imperative to select materials that are going to be functional and withstand daily use. This means understanding the ins and outs of every material and consider how you will use it. For example, Two-Pac cabinetry can provide a high quality finish and can be quite durable, however once chipped it is hard to repair. Another example is marble bench tops. While marble can be absolutely gorgeous in place, it is not practical for use in kitchens due to it being highly porous. It can stain very easily. Fortunately there are some great alternative, marble-look products on the market. No matter what type, size or style of kitchen you have or plan to have, one thing always rings true… You can never have enough storage. Fortunately modern kitchen design ideas lend themselves to increased storage ideas and more effective storage options. Draws in lieu of cabinets, hidden compartments and purpose built appliance storage can make your kitchen much more functional, giving you more space and freeing up your bench space. Butler’s pantries are also a popular design element and can be the ultimate storage solution. A well-designed butlers pantry allows for all your kitchen items to be out of site while still being easily accessible. Unfortunately, not all kitchen renovations will have the space available to incorporate a butler’s pantry but it is definitely something to think about if you have the space available. When renovating a kitchen, the flooring needs to be taken into consideration. You need to decide if you will be keeping the current flooring or including new flooring as part of the renovation. What you decide to do with the flooring can have an impact with the rest of your home. If your flooring extends beyond the kitchen and you plan to pull it up and replace it during the renovation, will you also be replacing the flooring in the connecting areas as well? On the other hand, if you decide to keep the current flooring you need to determine if the flooring extends underneath the current cabinetry. The flooring may need patching if you make major changes to the layout. Lighting is another major element that needs to be considered when carrying out a kitchen renovation. If your current kitchen is quite old, the existing lighting may not be functional at all and actually impede the use of the kitchen. The strategic choice of lighting over the kitchen bench makes it more practical for food preparation. Even if you are not replacing your current lighting, during a renovation is a great time to consider adding additional lighting, such as under cabinet lights to light up your working space or pendant lights over an island bench as a statement piece. When pulling out an old kitchen and replacing it with a new one, it is the perfect opportunity to think about installing extra plumbing and electrical elements. Old style kitchens are often lacking in power points and with our ever-increasing love for electrical appliances this can become an issue. 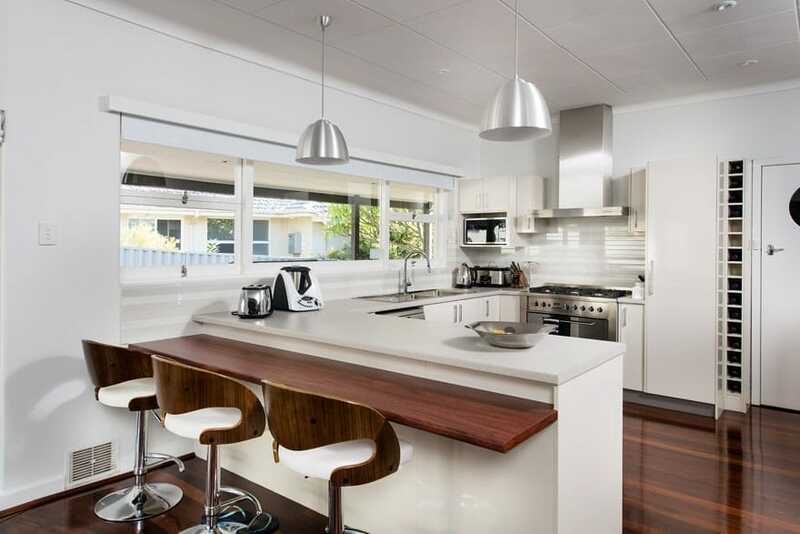 Adding extra power points when undertaking a kitchen renovation is always a good idea. As too is adding other electrical features to enhance your kitchen such as a kitchen waste disposal unit or charging station for all your devices. And let’s not forget to consider adding additional plumbing fixtures as well. If you are updating your electric cooktop with gas or buying a new fridge that needs access to water, now is your opportunity to have the pipework installed. Exactus Homes have completed numerous kitchen renovations and can talk you through all your design options and kitchen elements to ensure you are getting the most out of your kitchen renovation.